Pitchers and catchers are coming, pitchers and catchers are coming. One of the most optimistic times of the year arrived Sunday when pitchers and catchers reported to Oakland Athletics camp in Mesa, Arizona, officially beginning Spring Training in 2019. Most other tandems will report Tuesday and Wednesday with position players coming early next week. Among the many arriving in Major League camps filled with hope and light will be several of MLB.com's Top 100 prospects. Some of them are coming as non-roster invitees getting a small taste of the big league side of spring before inevitably getting reassigned. Others hope to get a real chance at cracking the Opening Day rosters of their respective Major League clubs, meaning the next few weeks will mark some of the biggest of their young careers to this point. 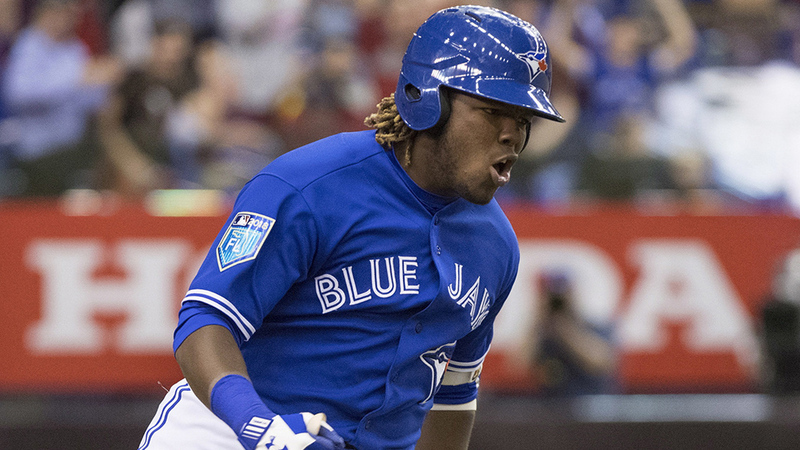 Vladimir Guerrero Jr., 3B, Blue Jays: Outside of Bryce Harper and Manny Machado in their new uniforms, there might not be a player more closely watched this spring than Guerrero. The third baseman, who turns 20 on March 16, is the game's top prospect for reasons discussed ad nauseam here and on other Minor League sites. Actually, there isn't much nausea involved when talking about an 80-grade bat and plus-plus power. After hitting .381/.437/.636 with 20 homers in the Minors last season, Guerrero is clearly ready for the Majors, and the Jays should give him a long look at the hot corner. Most know what will come next. He'll likely be sent back to Triple-A Buffalo to work on his defense at the hot corner before finally receiving the call to Toronto later in April, when the Jays can secure another year of team control. Before that though, the right-handed slugger has a chance to make it real difficult on the club if he destroys Grapefruit League pitching the way he's capable of. Remember last year's walk-off homer in Montreal? Padres young talent: As discussed in last week's National League West Prospect Projections piece, the Padres aren't expecting to contend in 2019, but they do have a wealth of prospects who could push for Major League jobs this spring. Luis Urias and Francisco Mejia both got Major League time last September and should compete for jobs at shortstop/second base and catcher. Urias might have the better shot as he faces little competition at short while Mejia will have to try outmuscle Austin Hedges for the starting backstop gig. But the bulk of the attention will go to No. 2 overall prospect Fernando Tatis Jr., who for all intents and purposes is the Padres' version of Guerrero here. It's possible the 20-year-old shortstop would have been right there next to Urias and Mejia in San Diego at the end of last season had he not required season-ending thumb surgery in July. Tatis has plus tools across the board, and many expect him to be the cornerstone of the next contender in San Diego. For now, he heads to camp as a non-roster invitee and will likely move to Triple-A El Paso upon the completion of Spring Training. One thing to watch, however, will be how the Padres dole out playing time at shortstop in Cactus League play. Tatis is likely to stick there long term, but Urias, who is more likely a second baseman, will need to get time there as well if that'll be his initial position in 2019. Manager Andy Green will have a bit of a juggling act with free-agent signing Ian Kinsler also in the mix at second, but he'll probably welcome that. Eloy Jimenez, OF, White Sox: The game's No. 3 overall prospect would likely be an above-average hitter in power and overall hit tool in the Major Leagues right now, and barring a shock Harper signing, he'll be the most closely followed White Sox outfielder this go-round in Arizona. Like Guerrero, he's likely ticketed for a trip back to the International League, where he batted .355/.399/.597 with 12 homers in 55 games last season, to keep his service-time clock from beginning to tick. But don't be surprised if the 22-year-old right-handed slugger lays waste to some Cactus League pitching before the all-but-inevitable option to Charlotte. One thing to keep in mind, however: Jimenez was shut down from playing winter ball with a quad injury in December. It's unlikely to hold him back initially, but Jimenez has dealt with spring injuries before, namely to his left knee and left pectoral last year. A fuller spring campaign would bring increased confidence he'll be on the South Side by the end of April. Victor Robles, OF Nationals: If the Nationals really don't bring back Harper, then all eyes will be on Robles as the heir apparent on the grass in the nation's capital, or rather West Palm Beach at first. The No. 4 overall prospect is tooled up and Major League-ready with 34 games at the top level on his resume. In the times Robles has been with Washington, he's been used primarily as a defensive replacement and pinch runner, though he got more starting time last September. This spring will be his first opportunity to really compete for a starting spot ahead of fellow center fielder Michael Taylor. If not for an injured elbow, it's possible we would have talked about Robles, not Juan Soto, as the Nationals' breakout young outfielder. Instead, 2019 has the chance to be the 21-year-old's time, and that starts this month on the Atlantic side of the Sunshine State. Nick Senzel, INF, Reds: What is Nick Senzel? That's not meant to be an existential question. The Reds are still trying to figure that out, for the best of reasons. Cincinnati took the Tennessee third baseman with the second overall pick in 2016 and have seen him only hit since with a career Minor League slash line of .314/.390/.513 over three seasons. In that same span, Eugenio Suarez has taken over as a long-term solution at the hot corner, and the Reds don't seem willing to move him off there to accommodate a younger player. Senzel got some time at second base with Triple-A Louisville last season before finger surgery and bouts of vertigo limited his game action, and he was supposed to pick up reps in the outfield in the Arizona Fall League before elbow surgery ended that as well. Cincinnati has made aggressive moves this offseason, like acquiring three Major Leaguers from the Dodgers and Sonny Gray from the Yankees. That would seem to indicate it wants all hands on deck. That would include Senzel and his prodigious offensive potential. The club just has to find a spot for him and quick. With Billy Hamilton non-tendered, the Reds could try to make Senzel into a center fielder, and it's possible his plus speed and arm could work there. That'll warrant attention this spring because the bat won't be a concern. Braves pitchers: Mike Soroka, Kyle Wright, Ian Anderson, Touki Toussaint and Bryse Wilson were all named Top-100 prospects this offseason. All but Anderson made their Major League debuts in 2018, meaning they come into camp with the reasonable expectation of competing for big league jobs. As it stands, four of the rotation spots are likely to be occupied by Mike Foltynewicz, Julio Teheran, Kevin Gausman and Sean Newcomb, leaving one open for the prospects. Toussaint might have the most inside track after five of his seven appearances were starts following his debut in mid-August. However, it's possible he's not the only one of the group to make the Majors out of camp. At the Winter Meetings, manager Brian Snitker expressed an interest in allowing young arms to get acquainted to the Majors through the bullpen and to serve as rotation help from there as the need arises. It's a role Atlanta has used with Max Fried in the past, and Soroka, Wright and the like could slide in next. Don't sleep on the next group either. Anderson is joined by Kyle Muller and Joey Wentz as non-roster invitees, and the next wave of Braves pitchers could create even more good depth problems with promising turns on the Major League side of Disney's Wide World of Sports. Jesus Luzardo, LHP, Athletics: How much of this has been lip service really? The A's constantly have mentioned Luzardo will be competing for a Major League spot in the spring, and coming off a somewhat shocking 97-win season, this isn't a club that can afford to waste time by keeping a rotation seat warm for a pitcher most know is one of its five best starting options. Pay no attention to Luzardo's 7.31 ERA in 16 brief innings at Triple-A last season. The No. 12 overall prospect has a three-pitch mix in his fastball, curveball and changeup, along with impressive control, to get Major League batters out right away. Mike Fiers and Marco Estrada are the only ones entering camp with basically guaranteed starting spots. Luzardo has a real chance to claim one of the the other three, and a strong spring would go a long way toward punching his first ticket to Oakland. Brent Honeywell, RHP, Rays: The last time the No. 28 overall prospect was seen on a professional mound, he was walking off it in frustration. The Rays right-hander underwent Tommy John surgery last Spring Training after feeling a pop in his right elbow during a bullpen session. Because of the nature of the procedure and the following rehab, Honeywell didn't pitch in 2018 and has only just recently begun throwing all of his pitches. Tampa Bay has said it hopes to see him back around June or July, making the thought of seeing the famed screwball in Grapefruit League play a fantasy. However, it'll be important to follow Honeywell's progression through the spring because if with Tampa Bay coming off its sixth-ever 90-win season, the club could certainly use his healthy services in 2019 if it is to catch Boston or New York in the American League East or snag a wild-card spot for the first time since 2013. Keston Hiura, 2B, Brewers It isn't hard to do the math here. The Brewers' biggest offensive hole is at second base. They have in their system the game's top second-base prospect, who finished 2018 at Double-A and is ranked as the game's 20th-best prospect on the strength of his plus-plus bat. Milwaukee's keystone spot is Hiura's to win -- at some point. That point isn't likely to be this spring, granted. As advanced a hitter as Hiura is, he's still only played half a season above Class A Advanced. A move to Triple-A San Antonio is his likely transaction coming out of Arizona. That said, the Brewers would love to see him hit enough in the spring to give them plenty to think about, potentially moving up his timeline, because unless they plan to bring back Mike Moustakas or acquire another third baseman and slide Travis Shaw back over to second, Hiura shouldn't have much of a problem winning the job from Cory Spangenberg eventually. The quicker the better with the NL Central expected to be a fierce battle this summer. Alex Verdugo, OF, Dodgers: It's not hard to see the world in which the No. 35 overall prospect isn't even a prospect anymore. Verdugo made his Major League debut on Sept. 1, 2017 and probably would have graduated from prospectdom last season if not for a previous embarrassment of outfield riches in Los Angeles. Instead, he's got 208 games of Triple-A experience on his resume, during which he's batted .321/.389/.452 with 16 homers, 17 steals and 18 outfield assists. Now, the times have changed a little with the Dodgers sending Yasiel Puig and Matt Kemp to the Reds this offseason. That would seem to give Verdugo (and his plus bat and plus-plus arm) at least the inside track on the fourth outfield spot, though Andrew Toles could have something to say about that and the signing of A.J. Pollock does complicate things. With his ability to play three outfield spots, manager Dave Roberts should give Verdugo plenty of run in the Cactus League, and if he puts all the tools available to him on display, it'll be tough to turn the 22-year-old away yet again. Justus Sheffield, LHP, Mariners: No time like spring to make a first impression. Led by several moves from noted trader Jerry Dipoto, the Mariners moved into rebuild/retool mode this offseason, and one of their more notable swaps came when they moved James Paxton to the Yankees for a three-player package headlined by the No. 43 overall prospect. It helps from a PR standpoint that the 22-year-old southpaw is practically Major League-ready after debuting out of New York's bullpen last September and posting a 2.56 ERA with 84 strikeouts in 88 Triple-A innings before that. The Mariners already have a pretty solidified rotation, headlined by new Japanese signing Yusei Kikuchi, but they acquired Sheffield to crash his way into that group at some point in 2019. Showing off his plus fastball and slider as well as some improved control in the spring could mean Sheffield heads to the Emerald City in short order. Peter Alonso, 1B, Mets: Alonso being on the Mets Opening Day roster seems like a long shot at this juncture because of the service-time issue. Fortunately, the No. 51 overall prospect happens to specialize in long shots. There's no doubt Alonso has earned his chance to get his first taste of Queens after leading the Minor Leagues with 36 home runs between Triple-A and Double-A last season. Alonso has even been vocal about hoping he would have received a promotion last September. For his part, new general manager Brodie Van Wagenen has tried to help the situation by insisting Alonso will get a real chance to win the first-base job this spring, and now the time has come to see just how much that talk meant. Should Alonso show plenty of his trademark power at Port St. Lucie, then he should have the inside track over Todd Frazier and Dominic Smith. Any hiccups, and the Mets will go to their other options and likely say Alonso needs to work on his defense (which admittedly does need work). Josh James, RHP, Astros: This is a real honest-to-goodness rotation race. The Astros' first four spots are going to Justin Verlander, Gerrit Cole, Wade Miley and Collin McHugh. But with Dallas Keuchel in free agency, that fifth spot remains for the taking, and the No. 62 overall prospect seems most primed to take it. James famously struck out 171 batters in 114 1/3 innings at Triple-A and Double-A last season, thanks to a velocity jump to the mid- to upper-90s, and he finished the season with six appearances (three starts with Houston after September and two more out of the bullpen in the American League Championship Series. It's clear he has little to prove in the upper level of the Minors. However, he does have to prove he's worthier of a Major League rotation spot than Brad Peacock and Framber Valdez, and that's assuming Houston doesn't make a last-minute swoop into free agency (potentially to bring back Keuchel even). Racking up the K's at West Palm Beach should win James the job. And hey, it doesn't hurt that one system projects him to be the game's most productive rookie pitcher in 2019.